The current remasters that air on FXX are poorly done, overly processed and have been butchered by cropping to 16:9. They’ve made no attempt to stabilise or correct any transfer issues. We can do better. This edition will also be presented frame for frame in 59.94 progressive. Usually animation preservations (like the aforementioned HDTV remaster) are simply IVTC’d down to 23.976 discarding anything that does not fit. Instead the Embiggened edition will be retaining the pulldown patterns from the NTSC source using full progressive frames. The reason? Since the show was edited on tape rather than on film, it does not have a consistent pulldown pattern, there are duplicated and dropped frames, orphaned fields, and areas where 60i overlays have been placed on top. For example scrolling text on TV screens, dissolves, fades to/from black. These are few and far between but worth preserving. Im expecting this project to take a very long time, so I want to do it right in the first place. The first few seasons are the worst, especially Season 2. See how jagged the middle frame is. I believe this is caused due to a bad tape to tape transfer, from one inferior format to another. It only affects certain shots, which you can identify with the black line at bottom of frame. Check out this scene here from Dancing Homer. Look at the lines on the dome. . Every few frames they become jagged, despite the frames being progressive. Take a look again zoomed in 2x and slowed down 10x. . See how the lines have a shadow that switches from below the line to above the line. This happens roughly every five frames, sometimes between frames and sometimes between fields, giving the jagged looking frames you can see. These clips were properly IVTC’d so the IVTCer doesnt see these frames as being a problem. Here’s that same scene taken from the HDTV version . You can see the exact same issue. So right now i’m writing a script that is about 700 lines long and runs at 4fps that detects these frames as well as a few other Interlacing issues, and outputs an Overides file for TFM. It does a great job of correctly picking the correct match code but I’m having trouble getting it to write the file. This project should hopefully do a lot of good and make a lot of videophile Simpsons fans happy. Happy to take any suggestions or help along the way. Interesting project. I too have been frustrated at not being able to get good quality early Simpsons episodes. I have many of the season DVDs, but had stopped purchasing them as I was frustrated by their quality, expecting something better to come along. Interesting project, but if the goal is to preserve the original format, you really shouldn’t be deinterlacing at all. Also, removing dirt originating from the cels, removing telecine wobble, and cel edges, isn’t preservation, but processing. Agreed the official new masters are horrible, though. I think those artefacts occur when a scene is time-stretched in post production. I’m not 100% sure Klasky Csupo would be to blame. I wonder if the 4:3 versions on the FX app are the original broadcast versions without the aforementioned changes… Those are the ones I watch and they seem to be original broadcast versions as many of those streaming episodes still have the “Presented in Dolby Surround” logo at the start of the episode. The audio definitely has a different sound than that of its 16:9 counterpart on the app. I guess an ideal preservation would be to reasseble the episodes from the 35mm neg which would get rid of both wobble and cel edges, but as this would be largely impossible. Deinterlacing and IVTCing gets us one step closer to the cells as they appear on the negative (99% will be original progressive frames rather than interpolated frames). You’re right about cel dirt though. But with every project like this you have to draw a line somewhere. Thats a good guess, but its far too consistent to be a timestretch. For one episode, Dead putters society, these artifacts appear halfway into the first act and are on almost every single shot till the end. Its consistent enough to be part of the workflow. Introduced somewhere along the chain from telecine to post. From what Ive heard the FXX 4:3 versions come from the DVD masters but I don’t think anyone has done a full check. I know at the very least, hitlers birthday/lassies birthday is the same on the DVD as FXX. I guess an ideal preservation would be to reasseble the episodes from the 35mm neg which would get rid of both wobble and cel edges, but as this would be largely impossible. Deinterlacing and IVTCing gets us one step closer to the cells as they appear on the negative (99% will be original progressive frames rather than interpolated frames). Then you would have to re-do all the video effects, which the early seasons made extensive use of. This is why this is a 59.94 remaster rather than 23.976, we keep film elements in the 2:3 pattern while video elements are kept at 60fps. When you have finished the script, please share. I’d like to test it on the first few episodes of Avatar, The Last Airbender. Will do, Im currently rewriting it from scratch, simplifying the process. The current HD remaster of ATLA should be done this way too i think. Really excited to see this! The DVDs honestly frustrate me, the quality seems oddly low for something so beloved and, honestly, not that old. I think a lot of the issues lie with the Tape masters. People really didn’t give a damn about good TV masters back then. I think a lot of these issues were almost invisible on even the best CRT monitors. And an update on what i call the Klasky Cuspo effect. Looks like i was wrong, i’ve seen it all the way out to Season 5, after KC stopped producing animation. Its likely that the jagged frames are from principal animation, whereas the clean frames could be pickups, animation done by different facilities or though a different telecine workflow. The fact that it is present in some scenes and not others and sometimes not present in shots that could very plausibly be pickups or retakes. That being said theres a special feature on the season 2 DVD where a simpsons producer in america has a 35mm version of a scene on a Flatbed editor, suggesting that Telecine is done in america rather than Korea. Yeah, there was little thought in terms of longevity, it seems. My HDTV shows so many problems via the DVD, it stuns me. Yeah, didn’t think it was Klasky related - not sure what happened there, likely a telecine issue. Rugrats episodes have the same issue (albeit, only specific episodes). Surprised they haven’t gone back to the film material for a complete upgrade with Simpsons (similar to Shout Factory and Pee-Wee’s Playhouse); would absolutely kill to see that. Then again, who knows if they sill have all the film + reels… Rugrats, on the other hand… Nickelodeon’s gigantic archive PROBABLY holds em all, haha. Sounds great. I like that you’re being careful with the difference between the VT effects and the standard telecine filmed bits. Are the PAL DVD releases any better? I have the full set on the shelf. My guess is they would be from the NTSC DVD masters, which were converted to PAL. I’ve been trying to rip my DVDs with Handbrake, and I haven’t figured out a way to cleanly fix the telecine issues. So definitely looking forward to this! Its on hold for the next month or so. The workflow is whats keeping me up all night on this one. But it will be done. Intestingly enough im listening to the commentaries on the DVDs, and while they dont talk in detail about the post process. They do mention film a lot, which leads me to believe that the negs are cut before being telecinied. All the way up to Season 7 at least. Also a lot of effects like bipacks (two animation negatives overlayed together) are described as “Opticals” where i would assume they would be created in video land. I might have to try my hand at applying some of these techniques to the first 4 volumes of Futurama as well. I got decent results from Handbrake’s decomb filter when making a 23.976fps encode, but there are still issues here and there in each episode. I’m behind this project 100%. As an avid Simpsons fanatic it interests me greatly. I recently downloaded one of the HD iTunes rips to see how they fared, and they’re not bad, but not great. Cropped which means I’m sure it’s FXX transfers. I ripped all my DVDs myself so that I could get the commentaries, which are fantastic, but they’re all in SD, so would love something much more cromulant. This projects still bubbling on the back burner. Ive had a lot of time to think about how I want to achieve this. Reassessing the goals and the scope of the programme. While the scripting that I’ve worked on is great, its not quite as reliable enough to capture all the bad frames without some manual direction first. What I’m going to do is start a system where anyone can easily contibute by watching an episode on Adobe Premiere and identifying problem areas and other anomalies, marking up the timeline and returning it to me, where I can create a file that will be read by avisynth for further processing. 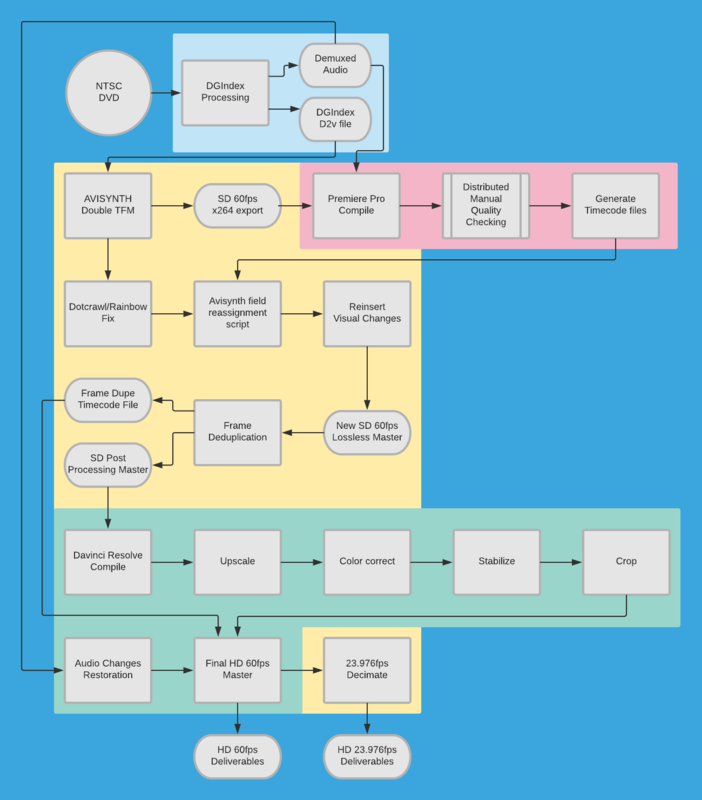 So to start this process I’ve created a workflow document, this is subject to change but shows some of the processes that are unique to this project. Blue is DGIndex, yellow is AVisynth, Pink is Premiere Pro, Green is Resolve. A few things to explain here. Most of the work will be done in two frame rates. 60fps which captures every frame that makes up the NTSC 60fps stream. And secondly a variable frame rate created by deduping the corrected 60fps master. Basically any frame that is duplicated, either through the 2:3 pulldown or simply the same video frame held twice, is removed. We’ll look at making a distinction between frames that are duplicated because of pulldown and frames that are simply cells photographed twice. Basically this is to protect the integrity of each frame by not creating slight differences between frames during the post processing phase. If I am to stabilize a shot, I want to avoid smoothing that stabilization over frames that are otherwise duplicates. Of course using that timecode file we can restore those frames. Final deliverables will be in both 60fps and a decimated 23.976fps. Possibly keep 60fps for myself and 23.976 could be for wider release. I’m looking at doing final processing in davinci resolve but could also consider other applications. There are some avisynth plugins that can do some pretty neat stuff with cartoons but I don’t want to push it too far like the FXX remasters do. Happy to take any questions and if you would like to volunteer to help with the manual quality checking please give me a PM. Now that phantom menace is all but finished ill surely be working on it more. I’m looking for more NTSC DVDs as the ones i have are crummy PAL ones. I also have all the season DVDs that were released (I don’t yet have Season 17) if it helps.